The TimeSerial() function returns the Time type based on the parameters provided (Hours, Minutes and Seconds). 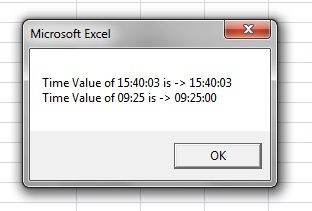 The DateValue() function converts string to a date which contains time and returns it. String that needs to convert into date which contains time. A time from 0:00:00 (12:00:00 AM) to 23:59:59 ( 11:59:59 PM). 211 queries in 0.101 seconds.